Mirvac's Gainsborough Greens community in Pimpama is the fastest selling land development on the Gold Coast, according to new data from the National Land Survey Program. (“NLSP”). The NLSP report shows Gainsborough Greens had an 11 per cent market share of Gold Coast land sales over the past three quarters. Mirvac Masterplanned Communities Queensland Development Director, Russell Berlee, said Gainsborough Greens' success could be attributed to its location, affordability and quality. "The northern Gold Coast is the fastest growing region in the city, primarily because land is more readily available in comparison to the central and southern areas," he said. 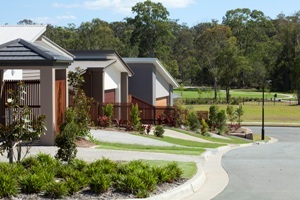 "Gainsborough Greens is well positioned to benefit from this growth, and our home and land prices - starting from just $370,000 - are among the most affordable on the market, so we are getting a lot of interest from young couples and families looking to live in a brand new community at great value. "We are creating a real community here, with high quality homes, a golf course and on site facilities including a recreation centre and large parks, so Gainsborough Greens is really a great package deal.